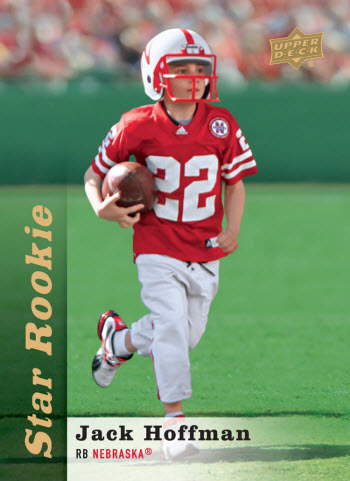 Jack Hoffman, the 7-Year-Old Nebraska Running Back Sensation, gets an Upper Deck Trading Card! Upper Deck created a special “Star Rookie” rookie card for Jack Hoffman from his memorable touchdown run! Carlsbad, CA (April 16, 2013) – On Saturday, April 6, a crowd of over 60,000 fans rose to their feet at Memorial Stadium in Nebraska and cheered louder than they ever had before at a spring game. Young Jack Hoffman took a handoff from quarterback Taylor Martinez and made his way 69 yards through a sea of defenders for a touchdown and celebrated with the entire team in the end zone. What makes this story so special is that Jack is only 7-years-old and is also a brain cancer patient. Team Jack will be releasing details on how fans can bid on these signed promotional cards in the coming weeks. In the meantime, Upper Deck encourages everyone to check out the “Team Jack” official website and to like the “Team Jack” Facebook page. Together we hope we can find a cure for pediatric brain cancer.